How can I get the results of a submitted form that looks exactly like the actual form? Is there any way to get the results of a submitted form so that it looks just like the actual form rather than a list of the questions and answers that the recipient is emailed? The purpose of Email Notifications (sent to you as the owner) is to notify you that someone made a submission to your form. The Autoresponders (sent to your customers) on the other hand are meant to act as a confirmation from the user's perspective that their submission has been received. 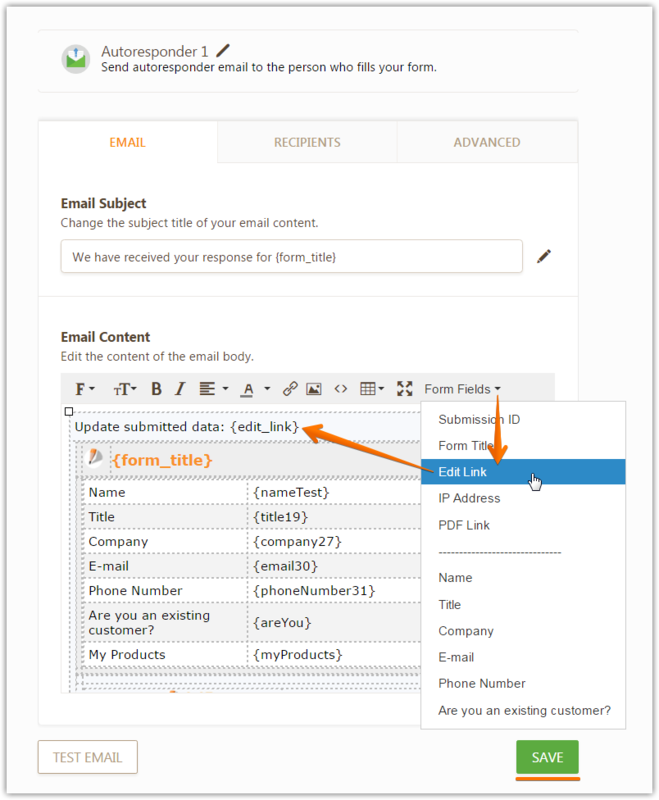 The closest you can get to getting an email that closely matches the layout (visually) of your form is to manually edit your Notification and Autoresponder templates. You can add images to it, format it using the formatting toolbar or even use HTML/CSS. But if you really need to see your user's submission data, as is, within the form, I recommend you click the EDIT SUBMISSION LINK at the bottom of the emails you receive. If you don't have this link at the bottom of your emails, you can add it on your email templates as well. Alternatively, you can go to your Submissions Page > pick a submission from the table at the bottom > then click EDIT at the top right to do the same thing.